For such a tiny country, Ecuador really punches its weight on the culinary scene. 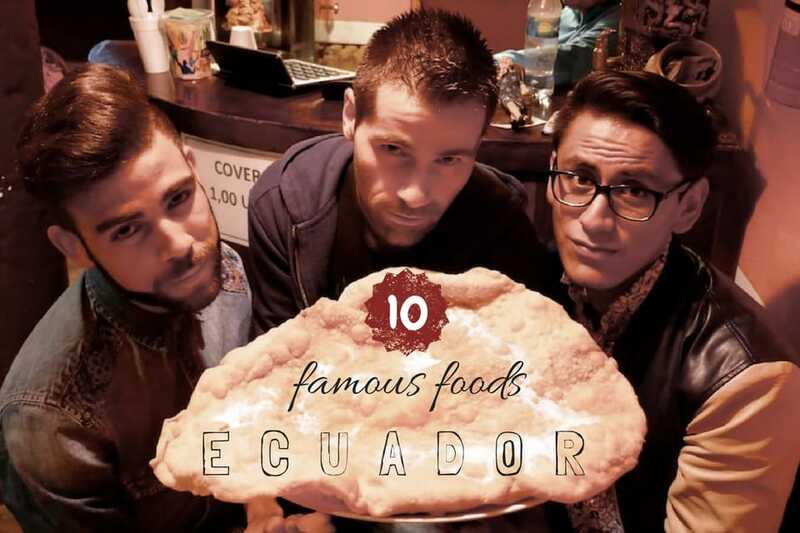 You don't associate Ecuador as a foodie destination. Instead images of Charles Darwin and giant Galapagos tortoises are more likely to spring to mind. That's what we thought when we first arrived, but very quickly discovered one of the tmost varied cuisines we've ever encountered in our travels with influences from the coast, Andes highlands and from its share of the Amazon basin. Remember: Ecuador is a tiny country, comparable in size to the UK or the state of Colorado in the US. Canelazo: the famous Ecuadorian cocktail! Hornado: well hey there Porky Pig! Fritada de Chancho: an Ecuadorian pork fry up! Llapingachos are one of Ecuador's most famous dishes. They are fried potato omelettes stuffed with cheese, cooked on a hot griddle until crispy and commonly served with a fried egg, avocado, meat and peanut sauce. They originated from the highlands but their popularity spread throughout the country, making them the national dish. 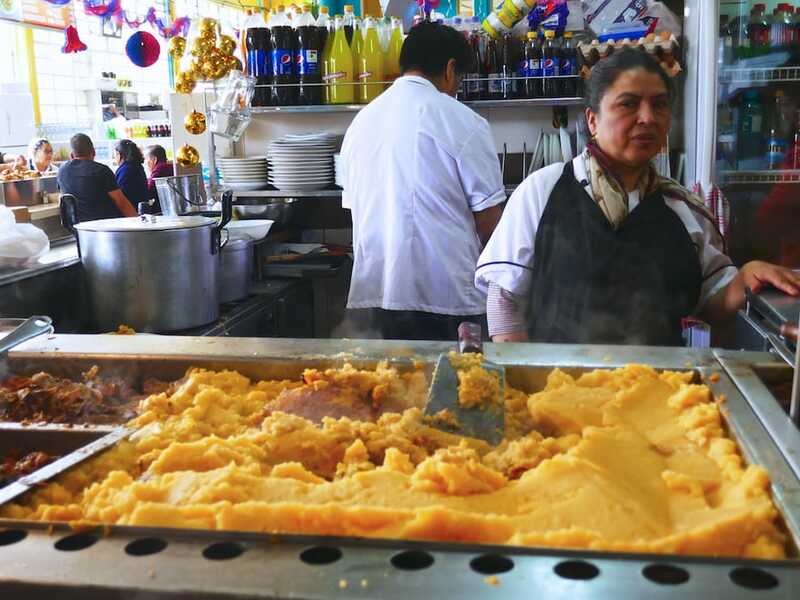 They are popular in the markets where they're prepared in bulk and served to hungry folk for lunch or as a side to another dish like hornados and fritadas. Potatoes are a common theme for anyone eating their way around Ecuador. Potatoes were first cultivated in South America by the Incas and as a result there are over 4,000 varieties of potatoes growing in the Andean highlands of Ecuador, Bolivia and Peru. 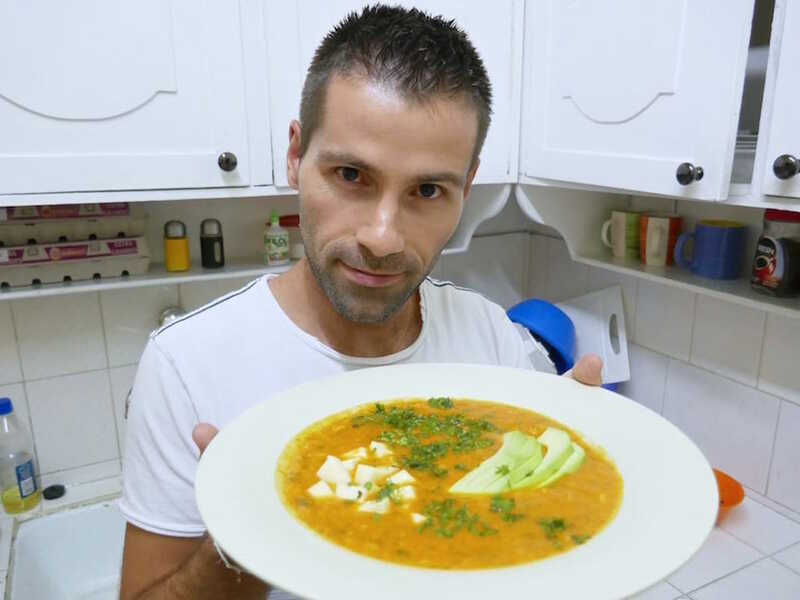 Locro de papa is a potato based soup with cheese, served with avocado and cooked with garlic, onions, achiote (annatto) powder and cilantro. It is particularly popular in the Andes highlands of Ecuador, where it’s the perfect accompaniment to the cold rainy weather. The word locro comes from the Quechua word, ruqru, which means stew, and papa means potato in Spanish. You can try out our recipe for locro de papa which kept us warm during those chilly evenings in Quito. Canelazo is a spiced hot drink from the highlands in Ecuador. It's similar to mulled wine but with a richer flavour. A typical canelazo contains cinnamon, sugar, naranjilla (Ecuadorian citrus fruit) and puntas. 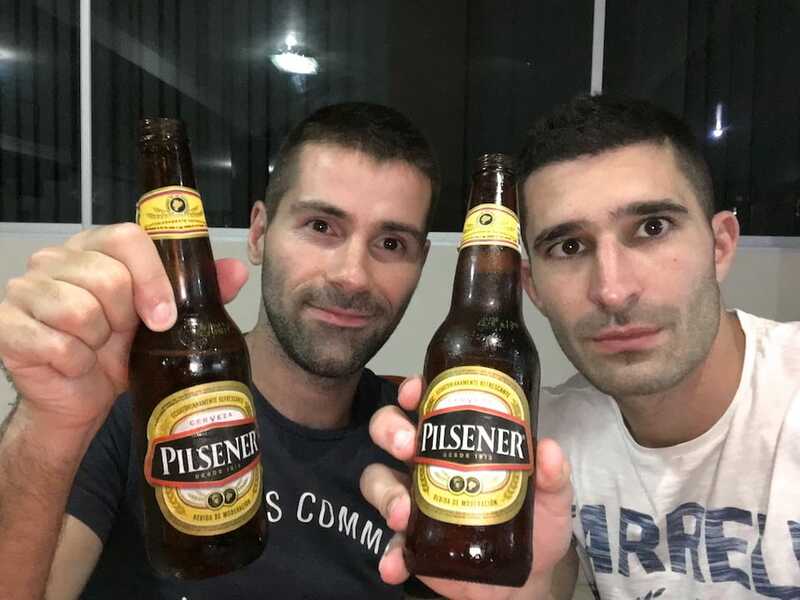 Puntas is a strong Ecuadorian alcoholic drink (around 30%-60%) made from sugar cane. The ones which are commercially made and sold in supermarkets are generally weaker compared to those that are home made. Ask around and a local will be able to point you in the direction of someone who makes puntas in their kitchen – but watch out: other than it being extremely strong, it's illegal to produce home made puntas in Ecuador! No Ecuadorian party is complete without a few pitchers of Canelazo or a round of puntas shots! Empanadas are famous throughout Latin America, particularly in the Argentinian cuisine. The Ecuadorian empanada de viento is made with regular dough, filled with cheese and served with sugar sprinkled on top. Other than the cheese, they are empty inside, just like the wind: viento. Best place to try one is in one of the many small bars in Quito's Old Town with a group of friends, washed down with lots of canelazo. 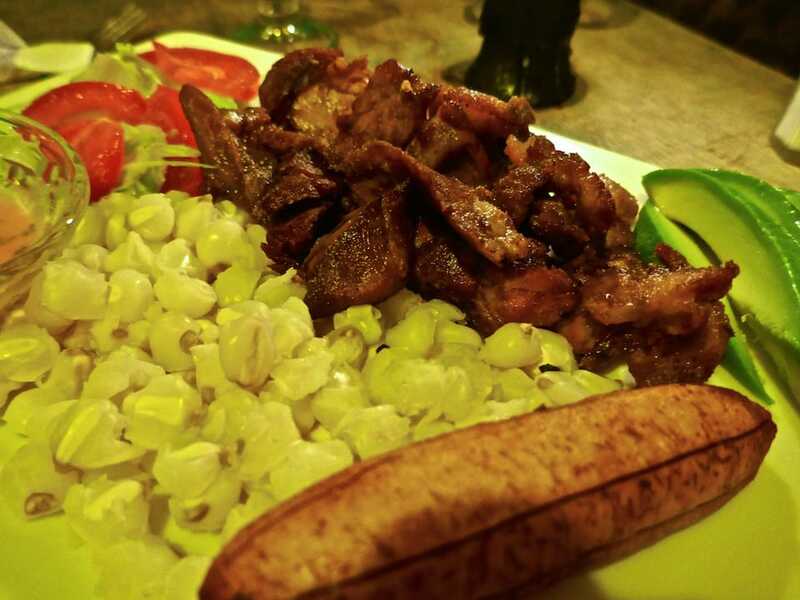 A churrasco is a very typical Ecuadorian dish and confusingly has the same name as the famous Brazilian barbecue. 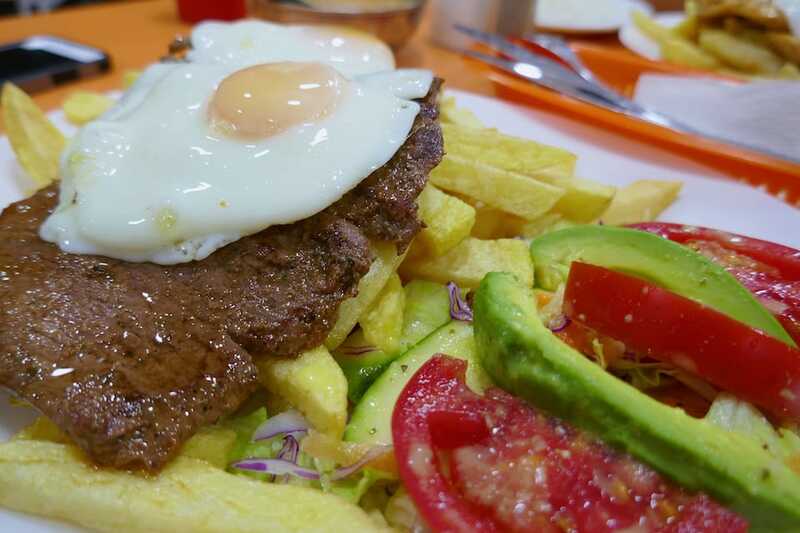 In Ecuador, churrasco refers to a plate of thinly sliced grilled steak topped with a fried egg, rice, plantains, chips, sliced avocado, salad, and spicy garlic aji sauce. It's a complete meal, which ticks all the boxes: hearty, delicious and contains a portion of carbs, protein and veg all in one. 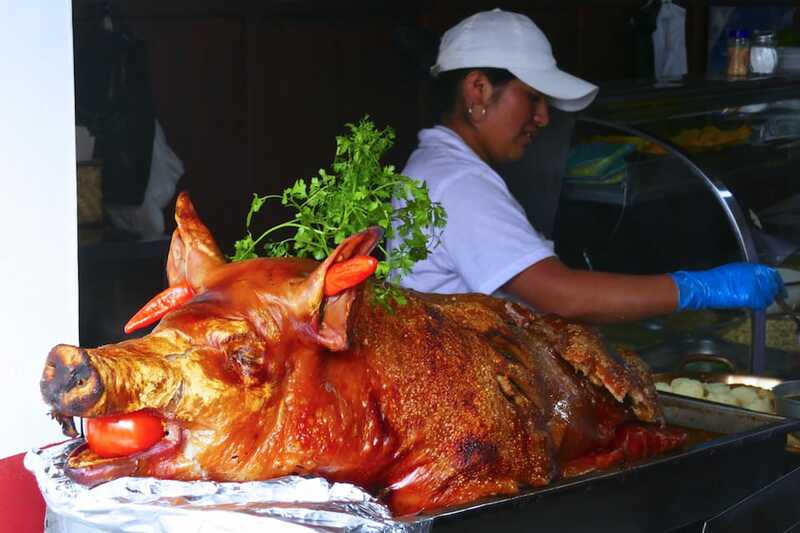 Hornado is quite bluntly a roasted pig, cooked whole, usually with a tomato stuffed into its mouth. It's popular in the highlands and we tried it in the markets in Quito and Otavalo. It reminded us a lot of that famous Filipino food – lechon suckling pig. Hornado is usually eaten wth llapingachos, mote (dried maize) and vegetables. Well hey there Porky Pig, ready for lunchtime? pitahayas: after travelling in Asia for 2 years, we became accustomed to dragon fruits. Pitahayas are similar to dragon fruits but they look more like prickly pears and taste much sweeter. 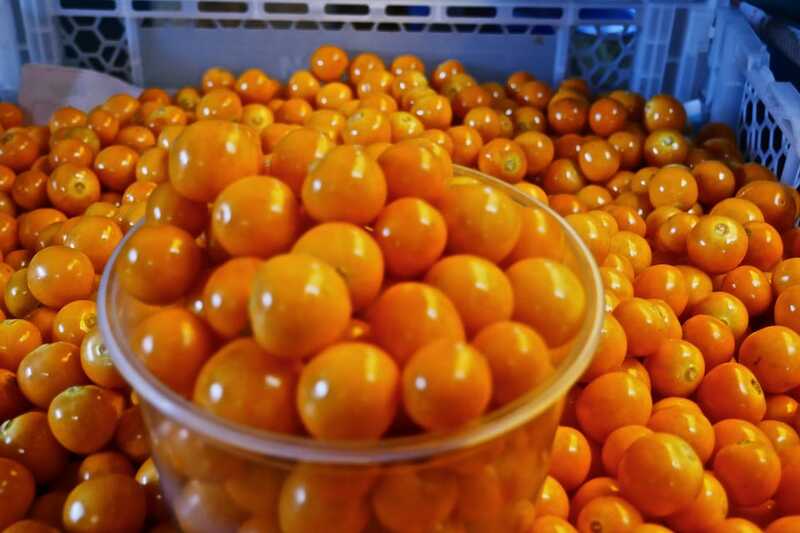 naranjillas: these are Ecuadorian citrus fruits and great as a smoothie or used to flavour canelazos. 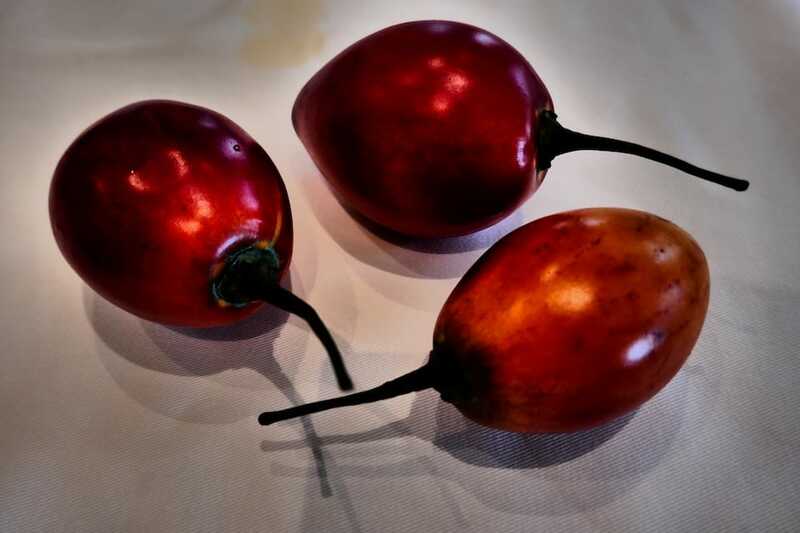 tree tomato: the tomate de arbol is too tangy and acidic to eat as a raw fruit, but as a smoothie, it's delicious! Quesadillas are normally associated as a type of Mexican melted cheese tortilla. In Ecuador, quesadillas are a pentagonal shaped pastry filled with both sweet and savoury flavours, similar to Portuguese queijada. Quesadillas are a popular breakfast treat and you can try our simple recipe for Ecuadorian quesadillas. In some cafes in Quito, the quesadillas are served with hot chocolate and mozzarella. Strange idea at first, but it’s actually a delicious snack worth trying out. 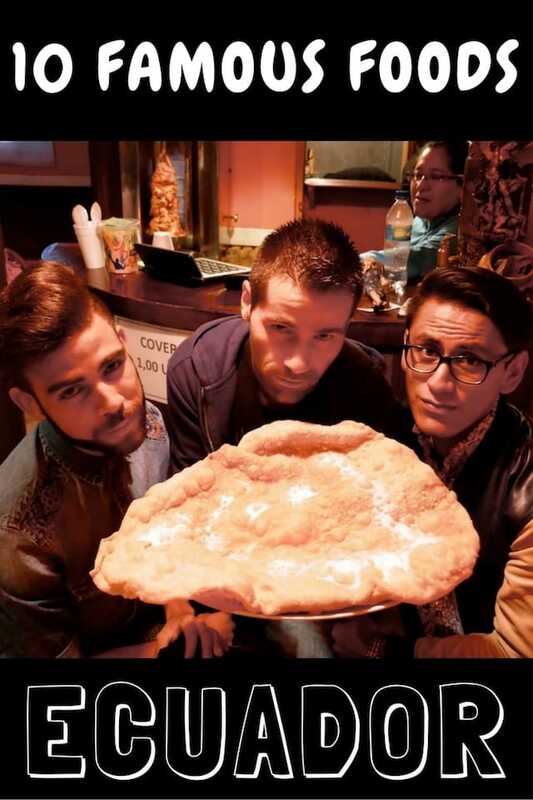 A fritada is a popular pork based Ecuadorian dish from the highlands. The pork is cooked in boiling water mixed with orange juice and various spices including cumin, onions, garlic, until the water evaporates. It is then fried in its fat until it becomes golden and crispy. The key to a delicious fritada is all the sides it comes with, which can include sweet fried plantains, llapingachos, hominy (coarsely ground corn), habas (fava beans), yuca, corn on the cob, camote (sweet potatoes), sweet plantains, boiled potatoes and maíz tostado (toasted dry corn). Secos are thick Ecuadorian stews, usually served with yellow rice and fried plantains. Seco de chivo is a goat stew, eaten for special occasions in Ecuador. Traditionally, it was made with chicha, a fermented corn beverage introduced by the Incas, but today beer is used instead. Flights: Domestic flights within Ecuador are inexpensive. However, international flights to Ecuador can be pricey. We recommend Skyscanner to research your flights. Their website is very easy to use and they always offer the best prices. You can even search for the cheapest flights for any given month. nice list you got there 🙂 will be using this when I finally get to Ecuador. Thanks!! 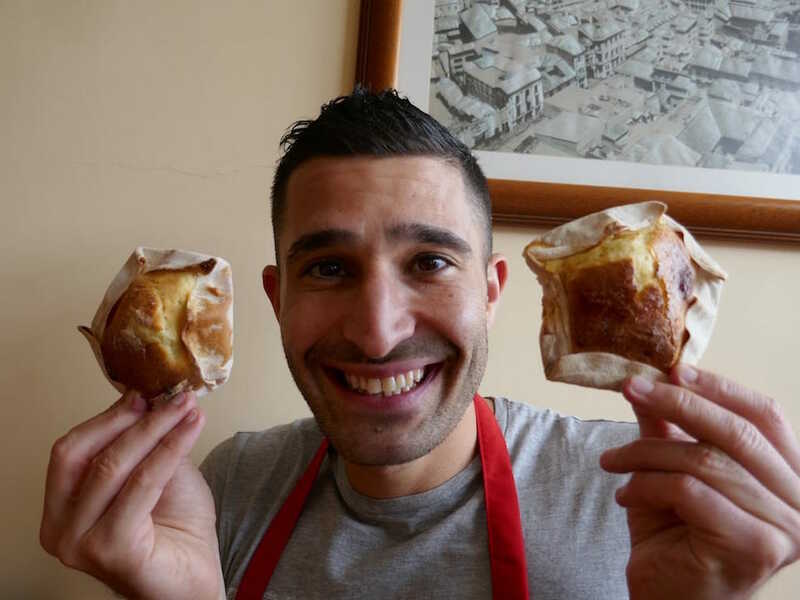 My best friend is Ecuadorian American so I enjoyed many fine empanadas growing up at my friend’s house. Amazing fare. So tasty, and wholesome too. I can’t wait to actually visit Ecuador so I can enjoy the fine fare in the country itself. I had no idea the place was as big as Colorado. Not big at all. I’m an Ecuadorian living in the US. Thanks for your top 10 list! It made me so nostalgic! But I must say you need to try food from the coast of Ecuador!! If you don’t you will miss some of the best our cuisine has to offer!! This is a good list, however, most dishes named here are from the highlands. You’ve got to try delicious foods from the coastal area, like pan de yuca, ceviche, viche de pescado o camarón, corviche, bolón de verde o de maduro, hayaca, tortilla de maiz (nothing to do with Mexican tortillas), empanadas de verde, any seafood dish at the beach, including those containing concha prieta, pulpo, etc. We’re in Ecuador now, so this is a perfect hit-list to ensure we try all this deliciousness before we take off! Have already checked off the locro de papa (my favorite! 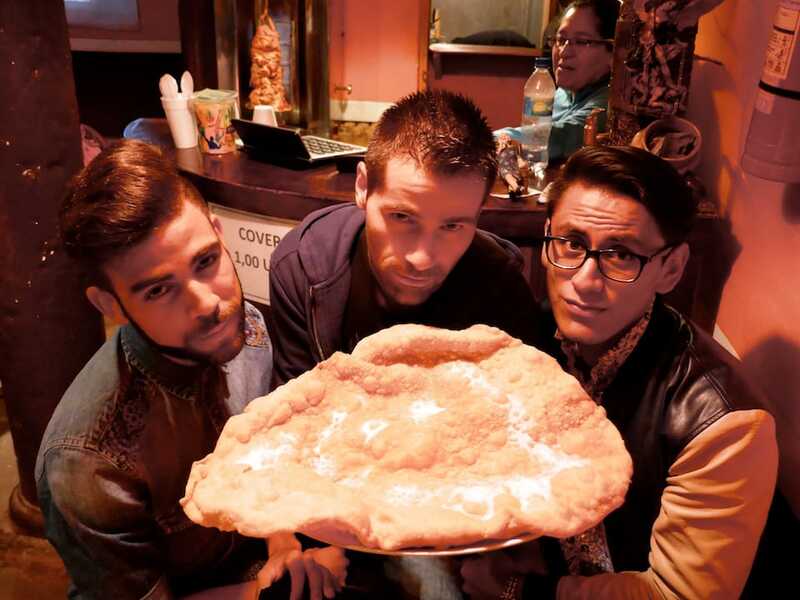 ), canelazo, and fritada. The churasco sounds great – haven’t had that one yet so thank you for putting that and a few others on my radar. Cheers! Great to hear guys 🙂 Love churrasco ?